The Acacia Nervosa or Rib Wattle are the first of the wattles to flower in the forest. The provide a wonderful contrast to the purple of the holly leaved hovea. 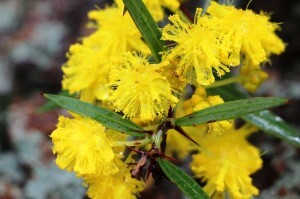 It is sometimes called the perfumed wattle because of its wonderful vanilla smell. It is certainly a flash of sunshine in the middle of winter. Kangaroos enjoy the seed pods which make it hard for seed collectors so it is not widely grown. I will have to look for the seed pods.